Bergamot (Citrus Bergamia) is a citrus fruit that is native to southern Italy, tropical parts of Asia and the Ivory Coast. This citrus fruit probably gets its name from the town of Bergamo in Lombardy, Italy, where it was commercially grown for the first time. Bergamot is rarely consumed as a fruit or fruit juice. It is primarily cultivated for its essential oil, which is obtained through cold compression of the fruit’s rind. Apart from its medicinal and therapeutic applications, the oil is widely used in perfumes, cosmetics as a flavoring agent for Earl Grey Tea. Bergamot essential oil, with its clean and refreshing citrus fragrance, is an effective antidote against depression, anxiety, urinary tract infections and nervous indigestion. The oil has a balancing and toning effect on the nervous system which makes it effective against psychological disturbances as well as painful spasms. 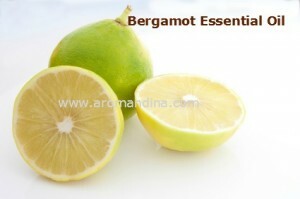 Bergamot is also used in the treatment of all kinds of infections owing to its strong antiseptic properties. Some people respond to emotional turmoil with overeating while others tend to starve themselves sick. The former results in flatulence, indigestion and colic, while the latter results in weakness and loss of immunity. Dr. Jean Valnet mentions the use of Bergamot for loss of appetite, but Patricia Davis cites that “its effect on the appetite is more regulating rather than stimulating”. Therefore, Bergamot is just as useful for anorexia nervosa as it is for compulsive eating. Use Bergamot oil for indigestion, gas and flatulence. Combine 1 teaspoon carrier oil with 2 drops of Bergamot essential oil 2 drops of German Chamomile essential oil 2 drops of Fennel essential oil. Massage the entire abdominal area with this blend, preferably at night just before going to bed. UTI or Urethritis is characterized by immense burning and discomfort during urination and a constant urge to urinate. If left untreated, the infection may spread upwards of the urethra to the bladder and even the kidneys. For individuals who are prone to recurrent bouts of Urinary Tract Infection, Bergamot is an effective remedy owing to its natural antiseptic properties. Bergamot essential oil blends amazingly well with Lavender and Tea Tree oils, which are powerful disinfectants by themselves. Mix 3 drops each of these oils to 1 cup of organic, plain yoghurt and prepare a sitz bath by filling a tub with enough warm water to cover your hips. Add the mixture to it, swish it well and sit in the bath for about 10 minutes. Repeat this everyday for at least a week to get rid of the nasty symptoms. To prevent recurrence, prepare a genital rinse by mixing 3 drops each of Bergamot and Lavender oils to a teaspoon of salt and dissolving this in an 8oz bottle of filtered water. Use a bit of this rinse every time you go to the bathroom to keep infection at bay. It is recommended that you drink lots of water to flush out the microbes and cut down on sugary and processed foods as these encourage the growth of bacteria and yeast in the urinary tract. Please note that these treatments may complement, but not substitute a medical prescription. If the infection does not show signs of improvement or is accompanied by fever or blood in the urine, consult a physician immediately. According to Gabriel Mojay, “Bergamot oil helps us to relax and “let go””. This means that Bergamot encourages the release of locked-up emotions that eventually lead to depression, anxiety and insomnia. The coolness of citrus also negates “hot” emotions like anger, frustration and irritability. To kick start your day on a positive note, put 5 drops of Bergamot oil on a dry washcloth and place this on your chest while taking a hot shower. Inhale the vapors and feel the positive energy charge up your body. With each deep breath, all those feelings of depression, anger and frustration will simply melt away. Even when you are not at home, keep a bottle of Bergamot essential oil handy. Place a few drops on a piece of paper towel (it works better than a tissue) and sniff it from time to time to refresh your mind. Once a week, add 3 drops each of Bergamot, Frankincense and Lavender essential oils to your bath water and soak in this rejuvenating aromatic bath. How do you use your Bergamot essential oil? Do write in to share how it has worked for you! Caution: Do not apply to skin to be exposed to sunlight or ultraviolet light; it increases the skin’s photosensitivity. it may irritate sensitive skin.